About Dr. Robert Shelton, M.D. Robert F. Shelton, M.D. is board-certified by the American Board of Pediatrics and has practiced with White-Wilson Medical Center in Fort Walton Beach, FL since 1990. Dr. Shelton received his medical doctor degree from the Medical University of South Carolina, in Charleston, SC. He completed his internship and residency in Pediatrics from the University of Florida College of Medicine in Gainesville, FL. 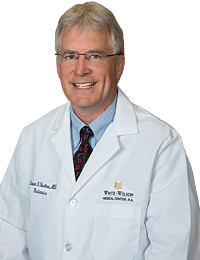 Dr. Shelton specializes in pediatric care, wellness care; preventive medicine; sick childcare; diagnosis and treatment of acute and chronic illnesses; and sports physicals for infants, children and adolescents under the age of 18. White-Wilson's Pediatric Clinic was voted "Best Pediatric Practice on the Emerald Coast" and "Best Pediatrician in Destin." When he is not practicing medicine, Dr. Shelton enjoys the relaxing lifestyle on the Emerald Coast with his wife and children.